Length: Up to 7.6 miles roundtrip, but you can turn around whenever you want. Time: About 3 hours for the full roundtrip. This is an out-and-back so when you’ve hiked half as long as you want to go, then turn around. Difficulty: Challenging. Two fairly steep climbs (500 and 600 feet) on the way towards Rocky Ridge. Just one 400 foot climb on the way back. Elevation Gain: 1271 feet on the way out and 500-600 feet on the way back. Best Season: Spring – when the wild flowers are blooming. Not recommended when it’s hot. 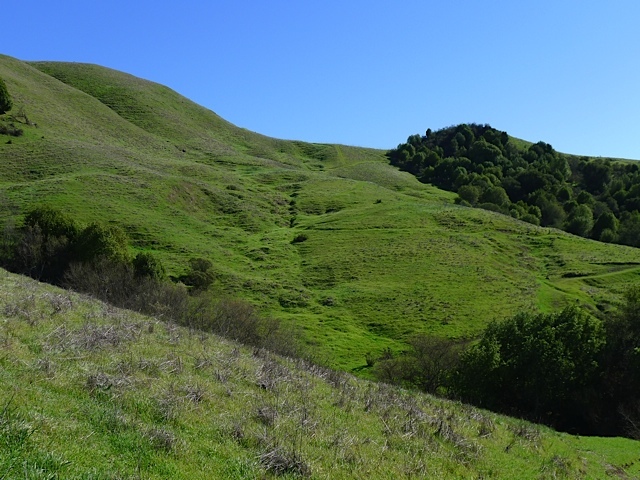 Highlights: The Rocky Ridge Trail takes you into one of the most unspoiled, remote areas in the East Bay, on a huge piece of EBMUD watershed land between Las Trampas Regional Wilderness and the Upper San Leandro Reservoir. This is your chance to see what the East Bay looked like before it was developed! Special Notes: This hike is challenging and mostly exposed to the sun, so bring sun protection, plenty of water, good hiking shoes/boots, and a snack. 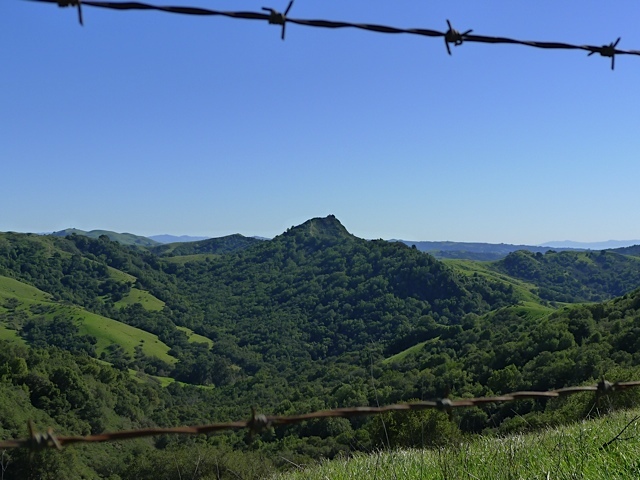 About Rocky Ridge… Rocky Ridge is one of the highest points in the East Bay, at just over 2000 feet, and provides a commanding vantage point. It was actually a Nike missile site during the Cold War in the late 50’s. It is most often accessed from the staging area at the end of Bolinger Canyon Road (off of Crow Canyon) and then by heading up the paved Rocky Ridge View Trail. 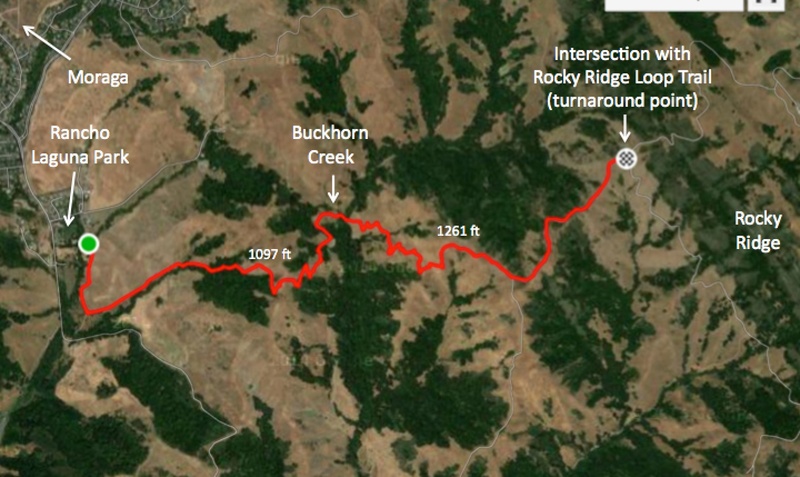 But the trail I’m going to describe approaches Rocky Ridge from EBMUD watershed land on the remote west side. Rocky Ridge has an interesting geological history. For millions of years, this area was a shallow sea and erosion from adjacent highlands built up thick layers of sediment. About 3-4 million years ago, these rock layers were thrust up to create the high ridge that we now see. The west-facing slope exposes the edges of many rock layers that were originally sediment under water. The full Rocky Ridge Trail begins at Valle Vista Staging Area and is 6.15 miles long one way, so I prefer to start at Rancho Laguna Park, making it 3.8 miles one way and 7.6 roundtrip (if you go to the end). 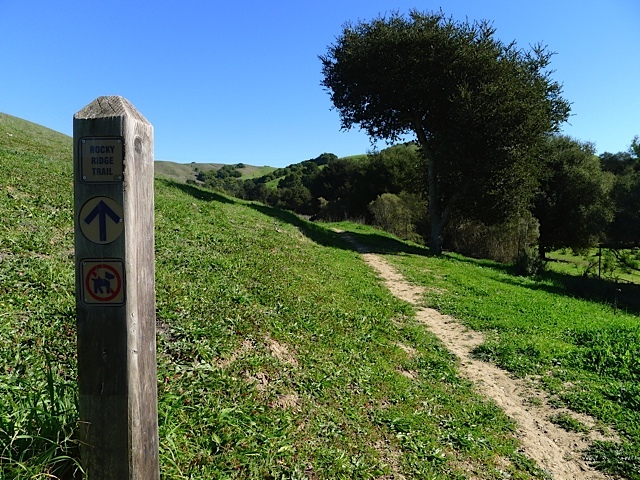 To start the hike, sign in with your EBMUD permit number and proceed through the gate. After climbing a little hill you’ll take a right on a fire road and go about .4 miles to reach a sign for Rocky Ridge Trail (heading East). The trail starts out fairly level, running adjacent to a creek on the right. Soon you’ll be climbing through a forest of oak and bay laurel trees. Then you’ll emerge onto a high meadow and continue climbing to the top of the first hill at 1097 feet. In the spring, the meadow and summit are littered with wildflowers and you might feel tempted to start singing “The hills are alive with…” from the Sound of Music. 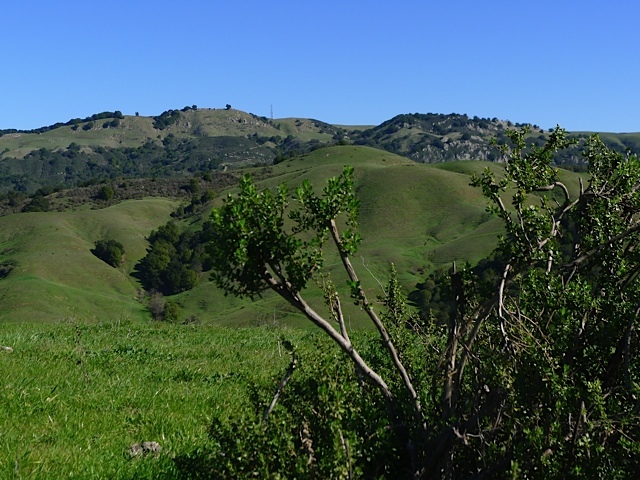 This first summit is a great spot to take in the view back towards Moraga and also to the east to see a terrific view of Rocky Ridge. Beyond the crest, the trail descends down to the valley below. You’ll reach a fire road, where you take a left, and then right away see a sign for Rocky Ridge Trail pointing to the right. You’ll soon reach Buckhorn Creek and an untouched riparian habitat. 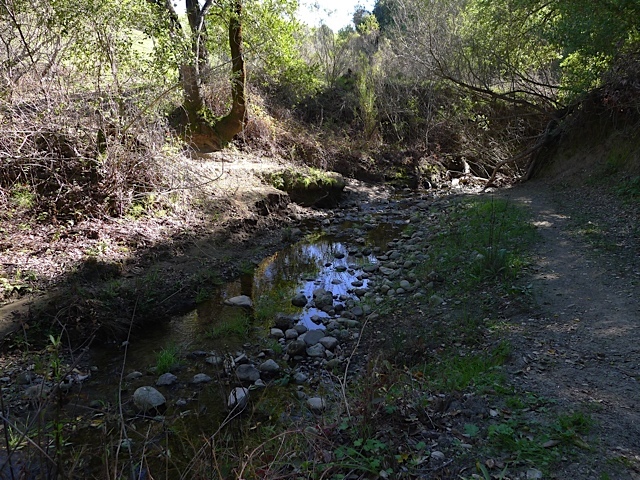 Buckhorn Creek drains into the Upper San Leandro Reservoir (completed in 1926), that you may have seen if you’ve ever hiked the Kings Canyon Trail from the Valle Vista Staging Area. This is why all of this is EBMUD land–because it is part of the huge watershed for the reservoir. There was actually a fierce battle in the late 80’s over EBMUD’s plan to put a new reservoir in the Buckhorn Creek valley. The plan was finally shelved leaving the valley in its natural state. After admiring the creek, it’s time to begin climbing again. This time you’ll zig-zag up a grassy slope, with about 600 feet of elevation gain, until reaching an even higher crest of 1261 feet. 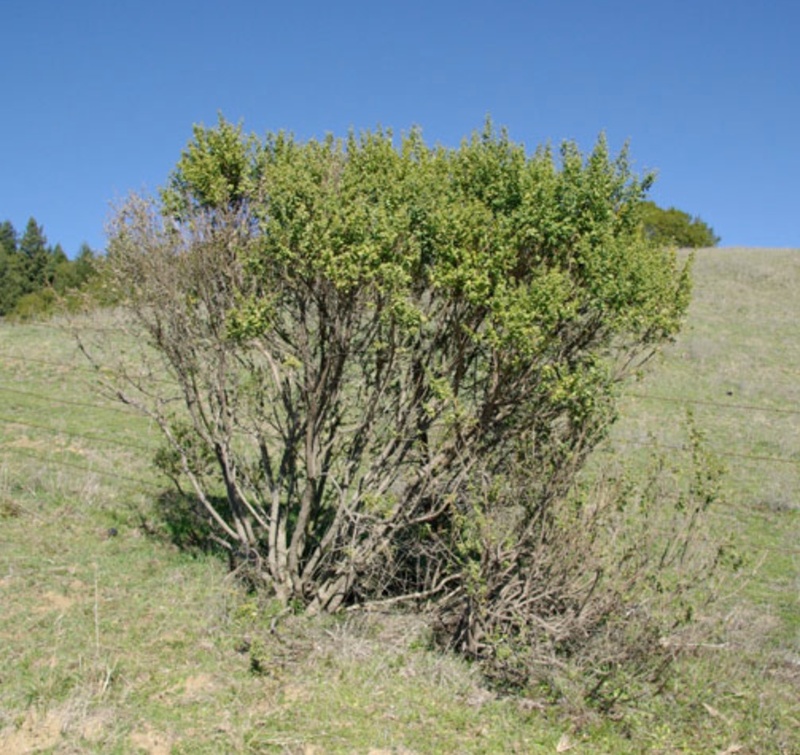 On your way up you may notice a shrub (see the picture) that somehow colonizes and survives on these dry hillsides. It’s called Coyote Brush. I actually have some growing in my back yard and this lets me know that it really is native to the area and can survive with almost no water from May-October. All native plants have evolved to survive fine in this area without any assistance from us (e.g. irrigation) and thus are ideal for a maintenance free yard. 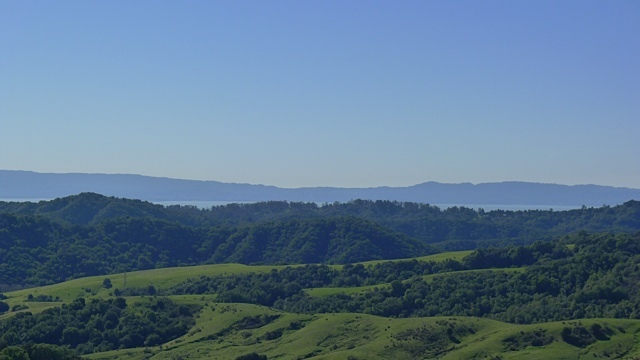 Once you reach the top of this second summit you’ll begin to be able to see the San Francisco Bay in the distance. You’ll reach a cattle gate where the trail meets a dirt road. Stay left and in about 3/4ths of a mile you’ll reach the Rocky Ridge Loop Trail, which circles around Rocky Ridge. On this last stretch you will have great views of the west face of Rocky Ridge and may also notice a cool looking peak to the south. That’s Ramage Peak (see picture). I haven’t been there yet, but it’s supposed to be a really neat spot! It can be visited from the seldom used Ramage Peak Trail. At the junction with Rocky Ridge Loop Trail, you’re about 3.8 miles from the start and it’s time to turn around, unless you decide to turn around sooner.